For the better part of two decades, James Baroud has dedicated himself to producing the finest hard shell rooftop tents in the world. 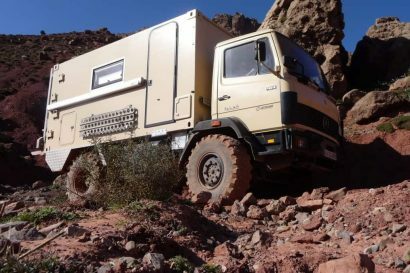 An experienced overlander and visionary, he was simply not satisfied with the available options for rooftop tents and felt most were under-built or poorly appointed. As he set to work to create his own rooftop tents, it became quickly apparent that he was pushing the envelope of design. 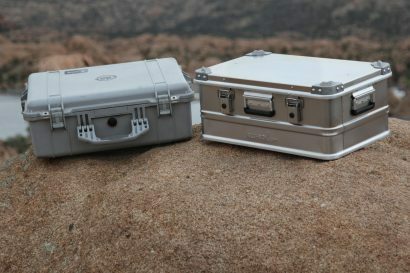 His Evasion Evolution rooftop tent is an exceptional example of his next-level offerings. Late last fall we were excited to take delivery of an Evasion Evolution for our own long term test. Few things halt office production here at Overland International HQ like the delivery of a 7 by 5 foot cardboard box, and rightfully so. Extracting it from it’s woody vault was an event in itself and quite exciting. Clearly James Baroud was not about to let this tent get damaged in transit. Before even seeing it in full form, we were already impressed. With a variety of vehicles in our fleet to play host to the Evasion Evo, we opted to pair it to our Land Rover LR4 fitted with an Eezi-Awn roof rack. This presented a minor hiccup as the tent was ideally designed to mount to the roof via a standard crossbar configuration. Two extruded aluminum tracks spaced 25” apart underneath the tent accept mounting brackets for up to three crossbars. Because we were using a platform style rack, we opted to use just two of the sets of brackets and mounted the tent via eight holes drilled directly into the rack slats. Installation was straight forward and took but an hour. With standard crossbars, installation would most likely only take 15 minutes. While not a heavy tent by any means, it did require three people to hoist it up onto the roof of our Land Rover. If the Evasion Evo is anything, it is easy to deploy. In the time it takes to walk around the truck, the tent can be fully set up—literally. I was expecting it to be easy, I just didn’t expect it to be so easy. Once the four latches are released, the four internal gas struts spring to life and the upper half of the tent elevates as if by magic. The only thing left to do is reach inside the tent, grab the ladder, and hook it in place on the side of the tent base. Done. The whole process requires but one hand and maybe 60 seconds if you take your time. There is no additional tinkering or toiling to set up a rain fly, insert any wire stays, or other such tasks. Rooftop tent manufacturers are always espousing the virtues of easy set up. This tent finally delivers on that promise. Once inside the Evasion Evo, it’s obvious James Baroud spends a lot of time using his own products. The first thing I noticed was the quality of materials and masterful execution of fabrication. No detail, big or small, was overlooked. After opening the three doors and the forward triangular window, I was immediately impressed with the amount of natural light flooding into the light colored interior. Whereas many tents feel dark and foreboding, the Evasion Evo feels vibrant and even opens up to near 360° views. For privacy and to seal out the elements, the whole structure can be stitched up tightly, and even then doesn’t evoke the sense of claustrophobia so many tents invite. Although there’s plenty of room inside the Evasion Evo, extra attention was given to organization with a generously sized cargo net along the ceiling and two large mesh cargo pockets affixed to the walls. An LED light at the head of the tent is within easy reach and illuminates the tent in full. The most unique feature of the interior is the electric fan built into the roof. Powered by a solar panel, the small fan is dead silent and serves to expel moist air to reduce condensation and the threat of mildew. A second fan blade assembly can be quickly placed in the fan housing to reverse the airflow for improved cooling on warm nights. My first efforts to stow the Evasion Evo culminated in less than stellar results and a steady stream of expletives. After a 20 minute wrestling match with the tent, I walked away with bruised knuckles, a hand full of hair, and a declaration that something was terribly wrong. It turns out the only thing terribly wrong was my process. On the second and third attempts to deploy and stow the tent, I came to realize it is a matter of finesse, not force. By the fourth attempt to stow the tent, I was able to have it fully latched and ready for the road in as little as six minutes with no fuss at all. The key to the process is patience. The first step is to collapse the forward half of the tent by way of pulling down on the easy to access webbing leash. The front latches can then be secured. The other helpful tip was to not close the doors all the way to the very bottom and then collapse the back half of the tent—slowly. 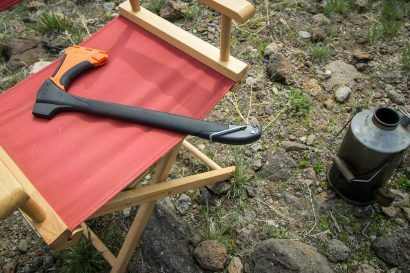 This keeps the tent walls from puffing outward like a bellows. Closing the latches and securing their secondary locks is the final step. The fastest time for getting the tent fully set up was one minute and seven seconds. The fastest time to get it stowed was six minutes and forty seconds. All in all, pretty amazing. I would be hard pressed to find many faults with the Evasion Evo. Even when I unleash my most critical eye, I find it to be a nearly perfect execution of an advanced design. That said, I do suspect the mesh is perhaps not fine enough to keep out all insects. I can usually find a myriad of potential improvements with any product, but that’s the best I could come up with for the Evasion Evo. It’s simply brilliant. One of the design elements I thought was pure genius is the inclusion of the third door at the foot of the tent. Not only does it add to the airflow and ingress of natural light, it has potential to be used as an actual door despite the lack of ladder attachments at the rear of the tent. 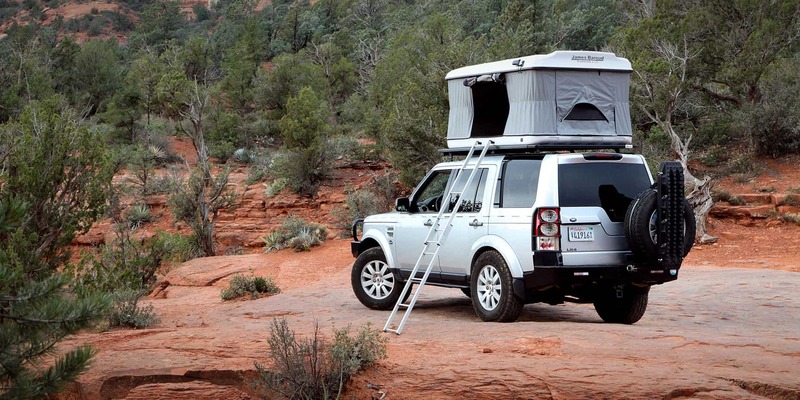 Our LR4 is not fitted with a rear ladder, but if it were, that would make for an ideal means of entry into the tent. A better use for the third door is to employ it as a pass-through for shuttling gear to and from the vehicle’s cargo. Other tents require the user to lob that gear in from the side of the tent. One of the advantages to a hard shell tent is the sleek aerodynamic shape of the stowed package. Even at freeway speeds, the tent was not only silent, it may have even improved the noise quality of our naked roof rack. We didn’t have enough time to fully evaluate the impact on fuel economy, but I suspect it has a nominal effect on a vehicle with the size and stature of our LR4. While the weight was noticeable, especially in low speed tight turns on pavement, it wasn’t enough to make the LR4 feel unstable. As rooftop tents go, this is about as good as it gets. It does take up a considerable amount of real estate on even a large roof, but nothing beats it in terms of set-up, take-down, or creature comforts. The quality is superb, the refinement unmatched, the price is even reasonable for what it is. James Baroud set out to make the best rooftop tent in the world, and I for one think he nailed it.